The wireless dropper post revolution is coming. 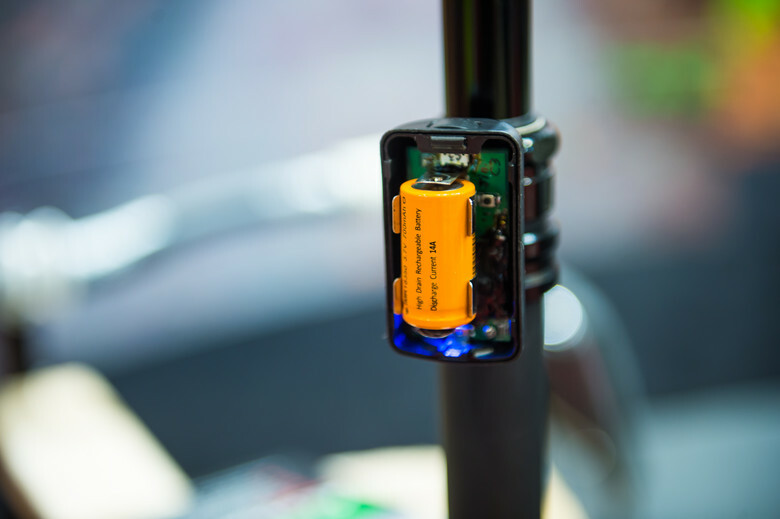 The prospect of needing less cables on your bike is exciting, but so far, the execution of the wireless dropper post has left something to be desired. 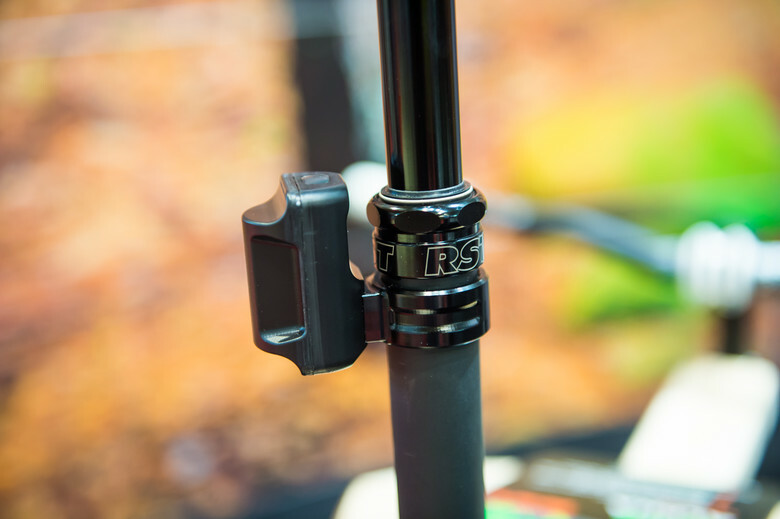 RST now joins the fray with their eDropper, a wireless dropper post weighing in at 580 grams for the 30.9, 125mm travel version. The post will also be available in 100mm and 150mm travel versions. 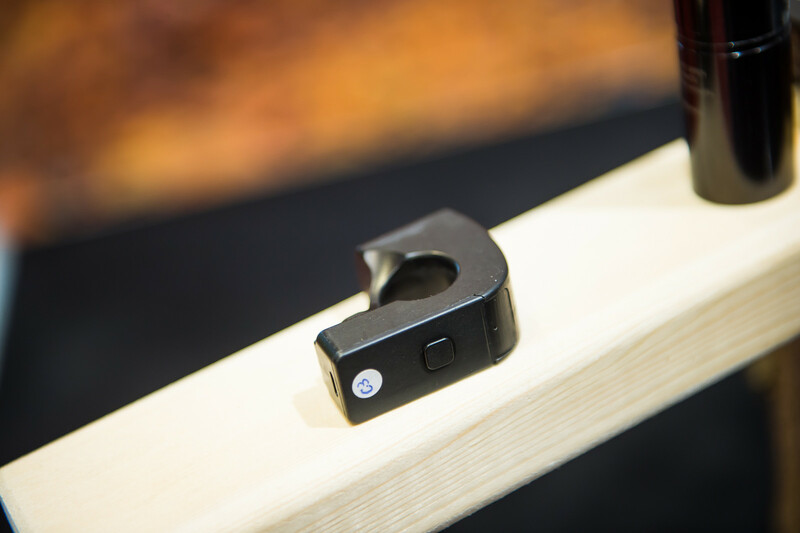 Dropping action is driven by a small wireless unit at the top of the post body, which is powered by a rechargeable, replaceable "camera-style" battery. The battery can be recharged via the built-in mini-USB port, or should you happen to get stuck with a flat battery and no USB port access, a fresh battery can be found in many gas stations or shops. One charge is good for about 2000 cycles, which should get you through a fair few rides. The remote control unit shown here is a prototype, the final version will be smaller and sleeker in appearance. We tested the dropping mechanism here at the booth, and the delay between pressing the button and the post valve opening seemed just about acceptable to us as a first impression. RST claims a delay of 0.6 seconds, which in the absence of reference points we'll call pretty quick. The operation of the eDropper is close to that of a regular dropper post. Press and hold the button to drop your post, release at the desired position. To extend, simply tap the button and the post pops all the way back up. With some adjustment, it seems to us like something you could get used to fairly easily, although we would of course have to test it in real life to know for sure. The eDropper will be available to purchase in March of 2018, pricing is yet to be determined. The Stitch sees the addition of a new coil version, for all you smooth operators out there. This coil-sprung, single-crown fork is available with 150mm to 180mm of travel, featuring RST's Hi-Flow damping system in a 36mm chassis equipped with SKF high-performance seals. It will be available in 26 and 27.5" versions and it should accept tires up to 2.5" wide. The lowers are cast magnesium with a quick release, 15mm axle, and the 27.5" version will likely weigh in at around 2800-2900 grams or so (numbers were not available). Adjustments offered include lo-speed compression and rebound, while for setting sag, you swap out the coil spring as needed. 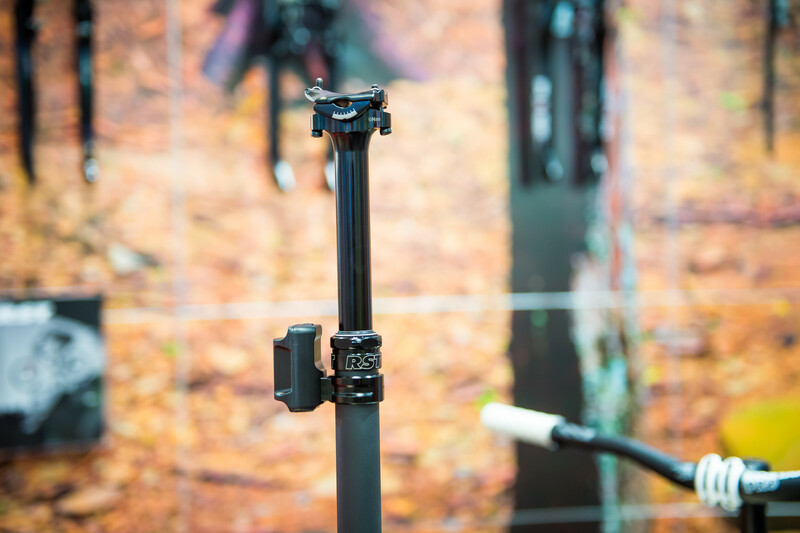 The Stitch also offers quick service ports at the top of the lower legs, which allow you to inject grease near the upper bushing to keep your fork running smoothly without having to open it up. MSRP is not known at this time, but the fork is going to be available shortly so stay tuned.